Factual error: The plastic explosive used on the cockpit door was C-4. When shot (as shown), C-4 does not explode; it requires the use of a detonator. Continuity mistake: When Harrison Ford tries to enter the conference room when he comes upstairs from the lower level, he first struggles with the guard to the conference room door. While fumbling with the keys, the guard "wakes up" and shoots 2 shots toward Harrison Ford, where he turns around and shoots back. Those 2 shots from the guard leave bullet holes in the conference room door. When Harrison finally enters the room, the bullet holes disappear. When the bad guys return, the bullet holes are gone. Visible crew/equipment: In a scene midway through the film where Glenn Close etc receive the fax from the plane, the tracks for the camera can be seen on the floor. Factual error: Characters are able to move from the front of the airplane to the back through the lower cargo hold. Their progress would be blocked in the middle of the airplane by a massive area of structure called the wing center section. 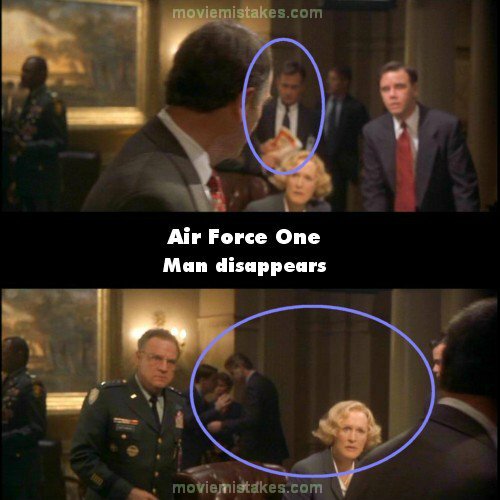 Revealing mistake: The whole time during the president's escape from AF1 (the scene where he's fighting with his corrupt agent) you can see through the airplane door that there is a loop in the movement of the water. It moves for about a second, and then stops, etc., etc. Continuity mistake: In the scene where the real pilots of AF1 are trying to land, you can see people and things flopping around in the plane. Later, the President enters a room that looks so neatly organized and clean that no one would ever know that they had such a roughly attempted landing. Continuity mistake: At the beginning, when AF1 is landed, and the two pilots and navigator get shot, a Russian guy takes over. AF1 is then driven around the airport. The Russian guy controlling AF1 speeds up to take off again. When he does take off he barely misses a plane that was on the ground. The next shot is from the back of AF1 and the plane that was on the ground has disappeared. Continuity mistake: In the beginning, it goes from 5 guys with white parachutes to 4 guys with black parachutes, back to 5 guys with white parachutes. Continuity mistake: In the scene when the Russian is shooting the 3 doors, on the second door, if you look in slow motion, you see 2 muzzle flashes before a hole is made in the door. The same on the 3rd door. Also, when he shoots the 3rd door, he puts 5 bullet holes in it, but when he opens it to check, there are 6 holes in the wall. Other mistake: General Ivan Radek (played by Jürgen Prochnow) is listed as General Alexander Radek in the closing credits. 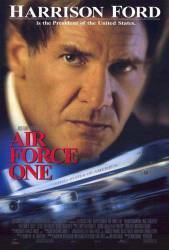 Factual error: When taking off from Moscow and throughout the film the Air Force One pilots are in uniform. AF1 pilots do not wear military uniforms to foreign countries. Factual error: The in-flight refuelling hardware on the real Air Force One makes a bulge visible below the cockpit window. The Boeing 747 used in the film lacks this bulge. Continuity mistake: In the scene where Gary Oldman shoots the National Security Advisor, the tips of his shirt collar vary between being tucked under his bulletproof vest and lying on top of it. It is untucked for the rest of the movie. Factual error: In the scene where AF1 gets refueled by a KC-10 Extender tanker, it would be impossible to pull the whole refueling probe out of the tanker plane, not to mention causing a fire. AF1 would simply break the end of the probe, the tanker plane crew would close the internal fuel valves, and there would be no fire. The refueling hardware used on USAF tanker aircraft has predetermined breaking points, since it's likely that any other aircraft getting refueled suddenly loses height, gets off course or something. Continuity mistake: When the traitor first begins to shoot the 3 people, we see a close up on one of the victims (the one who gets shot in the head). If you look behind him in slow mo, you'll notice that the furniture is already red (from the blood). Continuity mistake: Defense secretary Walter Dean makes such a big deal out of getting the cabinet to declare the president to be incapacitated, he gets Attorney General Ward to draw up the papers. They are then given to the Vice President to sign, and there are 16 signatures on it, presumably all the members of the cabinet. Funny thing is, the names are pretty easy to read using the zoom feature on the DVD player, and not one of the names is Dean or Ward.